August 14, 2017 – A 6U CubeSat that will operate in low-Earth orbit is on its way to the International Space Station (ISS) aboard a SpaceX Dragon spacecraft following today’s 10:31 a.m. MDT launch. 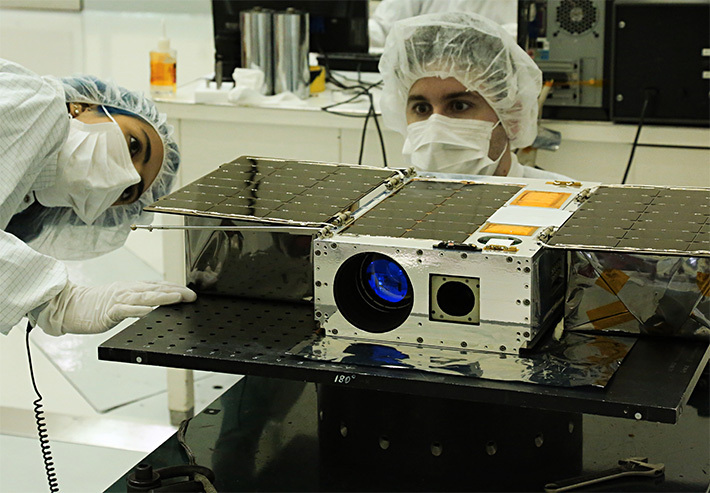 The Arcsecond Space Telescope Enabling Research in Astrophysics (ASTERIA) includes solar arrays made by MMA Design LLC and an Attitude Control Subsystem built by Blue Canyon Technologies. Both companies are located in Boulder, Colorado. ASTERIA will be launched from the ISS in October 2017 via the Nanoracks Cubesat Deployer beginning its 90-day technology demonstration mission. The goal of ASTERIA is to achieve arcsecond-level line of sight pointing error and highly stable focal plane temperature control. These technologies will enable precision photometry, i.e. the careful measurement of stellar brightness over time. 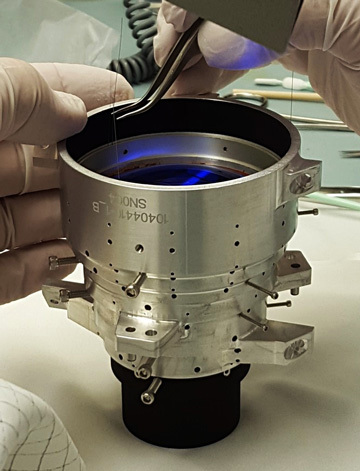 This in turn provides a way to study stellar activity, transiting exoplanets, and other astrophysical phenomena, both during the ASTERIA mission and in future CubeSat constellations. The payload consists of a lens and baffle assembly, a CMOS imager, and a two-axis piezoelectric positioning stage on which the focal plane is mounted. A set of commercial reaction wheels provides coarse attitude control. Fine pointing control is achieved by tracking a set of guide stars on the CMOS sensor and moving the piezoelectric stage to compensate for residual pointing errors. Precision thermal control is achieved by isolating the payload from the spacecraft bus, passively cooling the detector, and using trim heaters to perform small temperature corrections over the course of an observation. The ASTERIA project is a collaboration with MIT and is funded at JPL through the Phaeton Program for training early career employees. JPL is responsible for overall project management, systems engineering, spacecraft implementation, integration and test, and mission operations. The main spacecraft subsystem suppliers are Blue Canyon Technologies (Attitude Control Subsystem), Vulcan Wireless (Telecommunications Subsystem), MMA Design LLC (Solar Arrays), GomSpace (Power subsystem and Batteries), Spaceflight Industries (Flight computer), Ecliptic Enterprises (Focal Plane), Physik Instrumente (piezo stage), and Thermotive (thermal hardware). Morehead State University will provide spacecraft tracking, telemetry, and control services to the Mission Operations team at JPL. MIT will perform target selection and analysis of stellar photometry data from ASTERIA. In addition to ASTERIA, more than 6,400 pounds of research equipment, cargo and supplies were launched on a Falcon 9 rocket from Launch Complex 39A at NASA’s Kennedy Space Center in Florida on SpaceX’s 12th commercial resupply mission. The cargo will arrive at the space station Wednesday, August 16, at which time astronauts Jack Fischer of NASA and Paolo Nespoli of ESA will use the space station’s robotic arm to capture it. Dragon is scheduled to depart the space station in mid-September, returning more than 3,300 pounds of science, hardware and crew supplies to Earth.